No Scooting with Our Patented Approach! Even at High Intensity! Excy’s patented Keeper is a flexible durable material made of vinyl and coated fabric used to establish a strong connection between you and the Excy cycling system to keep it stationary and prevent it from scooting. It’s super easy to set up and rolls up tightly to carry in a purse or laptop bag. Simply place your body weight on the Keeper, whether in a standing, kneeling, lying, or sitting position. The Keeper conveniently then turns your Excy system and what you already have—a chair, table, and floor—into a powerful recumbent exercise bike, ergometer, and full body cross trainer. Its beauty is in its simplicity! Ride Excy as a recumbent exercise bike from your own comfortable chair anytime you want. You can easily multi-task and do things like talk on the phone, read a book, help kids with homework, check email or even socialize with friends. Recumbent bikes are known to provide a great option for a low-impact cardiovascular activity because they place less stress on the joints than a treadmill. In addition to being lightweight, portable, and fun, the Excy recumbent bike position is also comfortable because you don’t have to worry about a new saddle or seat since you can use your own chair and even place pillows behind you or under your bottom for added comfort. A recumbent bike can provide a cardiovascular workout for users of virtually all ability level. It is safe and provides a low impact total body workout. 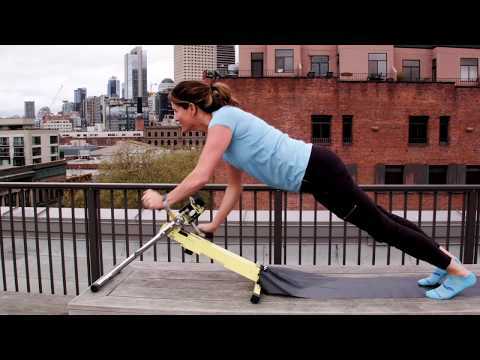 Lay on your back on the Excy Keeper, engage your core and start pedaling your way to sculpting lean glutes, quads, calves and abs by using Excy with the Excy Keeper to prohibit it from scooting away. You’ll get an amazing workout without the burden of a stationary, clunky or heavy piece of equipment. You can quickly rotate between arm and leg workouts, while engaging your core! Whether trying to burn calories or tone, it all comes down to what you’re willing to put into your workout. The harder you work the more improvement you will see and Excy provides a large range of resistance capabilities for broad versatility for cardio and strength training.